Usually, whenever Rich Guy and I meet up for eats, it doesn't come cheap. After all, Rich Guy is well-known for avoiding diners, drive-ins and dives... I'm sure he is not a Guy Fieri fan. Too bad really since good food can usually be found in the most unusual of places. However, Rich Guy does make exceptions, particularly when it comes to South Asian food. You see, it is almost unavoidable that many South Asian restaurants are not exactly the most classy of establishments. I'm not saying there aren't any, it is just not that common. Therefore, he had no objections in meeting me for some Vietnamese food at Pho Boi. 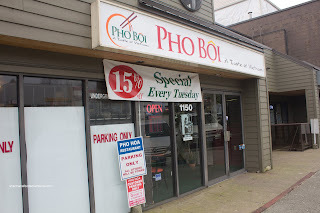 Now if you look closely at the picture, the parking sign reads "Pho Hoa". Yes, this was a former location of the big Vietnamese chain. Other than the name change, not much seemed to be different. 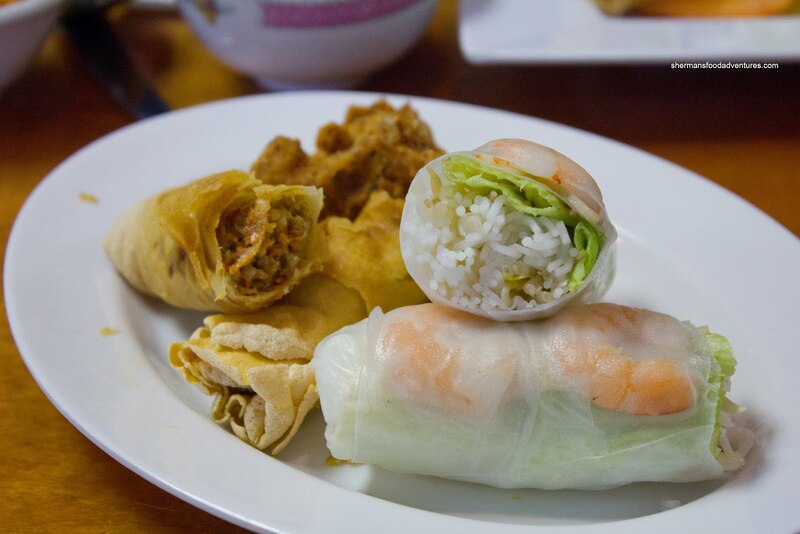 We started with the Appetizer Combo which included one each of the Shrimp Salad Roll and Spring Roll. In addition, there were 3 fried drumettes. The salad roll was not very good due to the really dry and unchewable (in parts) rice wrapper. On the inside, some basil would've been a nice addition for flavour. As for the spring roll, it was okay. 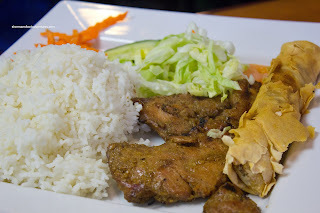 A bit scrawny, but it was crispy and the filling was not gritty and actually quite flavourful. The 3 wings were an utter disaster though. They were fried far too long and they were pretty skinny. 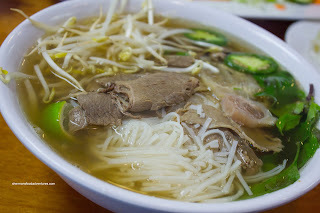 For myself, I had the Pho Dac Biet which was pretty standard. What I mean by that is there was an average amount of noodles (which were not overcooked) and a decent amount of meat (which was tender). In terms of the broth, I found it to be mild with only a some hint of MSG. I would say it was somewhere in between savoury and sweet without very little meat flavour. Rich Guy went with his go-to dish being the Lemongrass Chicken with rice. As you can clearly see, the chicken was far from grilled. Lacking in colour and char marks, the flavour was muted. Sure there was lemongrass and hints of sweetness, but it was weak. Consequently, the "meh" nature of the food here didn't make us forget Pho Hoa. Rather, it almost seems like merely a name change and nothing much else. With that being said, the place is okay in a pinch though, but not our first choice. Oh boi ! 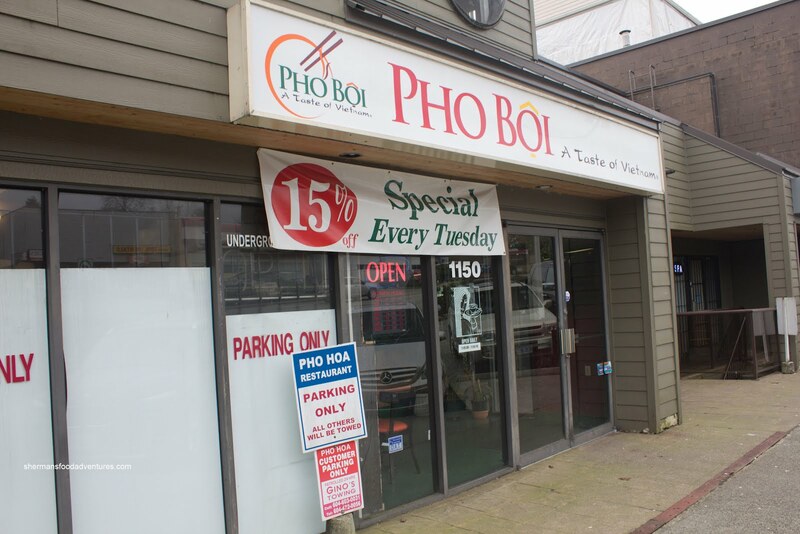 So Pho Boi is now a chain ?